The Charlotte Observer features Charlotte Saturday MBA student Chuck Harr’s first-person account of meeting Warren Buffett with his fellow students. This was it. After a competitive selection process, weeks of preparation which included reading assignments, book discussion, and crafting questions which Warren Buffett had promised to answer, we were all assembled in a small auditorium in Kiewit Plaza in Omaha. 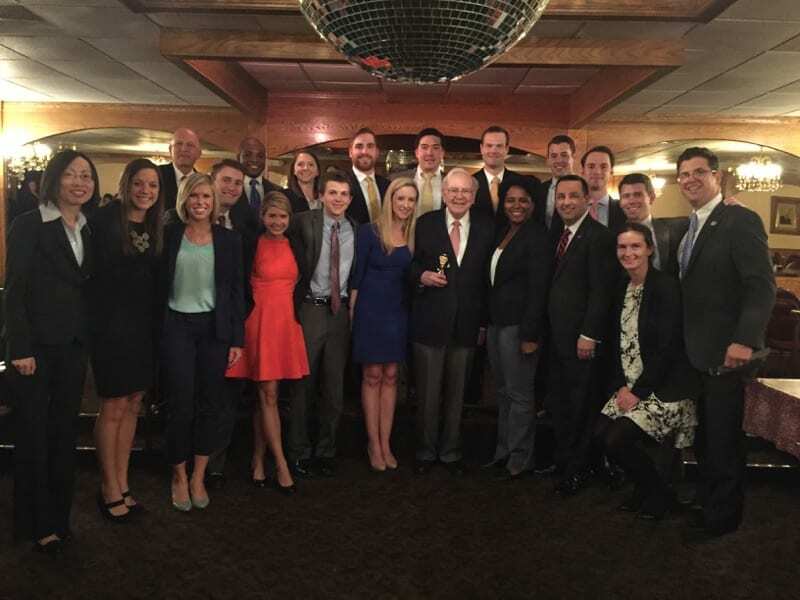 Several Wake Forest Charlotte working professional MBA students and graduate business students from the school’s main campus in Winston-Salem had been invited along with the best students from seven other schools – Iowa State, Massachusetts Institute of Technology (MIT), Northern Arizona, St. Louis University, University of Nebraska-Omaha, University of Southern California and Villanova. All were eagerly anticipating our interaction with the master of finance and investing, Warren Buffett. Read the full story at The Charlotte Observer. The students who traveled to Nebraska included Master of Arts in Management student Xavier Herbert, along with Master of Science in Accountancy students Jake Cucarola, Erik Hannemann, Jesse Parris, Jamie Schwint, Jonathan Steinway and Emma Templeman. James Deskins, Terika McCall, B. Scott Miller, David Miller and Shannon Pierce from the Winston-Salem Evening MBA program, Sherry Bartley, Chuck Harr, Michael T. Hogg, Justin Leazer from the Charlotte Evening MBA program and Jessica O’Neal Hill, Mac Steele and Chris Strout from Charlotte Saturday MBA program also made the trip. Ya-wen Yang, associate professor of accounting and Coca-Cola fellow, helped students prepare for their meeting with Warren Buffett weeks in advance. Students read the book “The Snowball” about Mr. Buffett, and participated in discussions and writing assignments related to the book. While in Omaha, they toured the Nebraska Furniture Mart, joined a Q&A discussion and had lunch with the Berkshire Hathaway CEO.